President Donald Trump’s second State of the Union address will not take place on Tuesday, an aide to House Speaker Nancy Pelosi told CNN. In order to give an address like the State of the Union to a joint session of Congress, both the House and Senate must pass a resolution allowing it to happen, making Pelosi’s voice an important part of the discussions. I truly believe that this is a new low in partisan politics. There is no excuse for this. The State of the Union Speech is a tradition and should not be the victim of political pettiness. If this is the attitude the House of Representatives is going to show to the President, he needs to cut to the chase now, declare an emergency on the southern border, build a wall, and tell Ms. Pelosi to go pound sand. I also think Ms. Pelosi is trying to block President Trump from speaking directly to the American people about the need for border security on our southern border. She is definitely out over her skis on this one. In October 2002, Paul Wellstone was killed in a plane crash while running for office in Minnesota. A Memorial Service was held in October 2002. Did the memorial service for Paul Wellstone cost Democrats the election? The Memorial Service was a Democrat pep rally that disgusted many of the people who watched it. Unfortunately, we are seeing a similar phenomena with the media’s handling of the death of John McCain. John McCain was an American hero–he stayed in Hanoi with his men after being given the chance to come home. He was tortured. He showed courage. Fine. We can celebrate that aspect of his life. Let’s not forget, however, that he betrayed the voters of Arizona who re-elected him to repeal ObamaCare after he promised to do so, but he refused to vote to repeal ObamaCare because of his dislike for President Trump. Let’s remember what the Democrats who are so lavishly praising him right now said about him when he ran against Barack Obama in 2008. This funeral has turned into pure political theater. Ivanka and Jared attended the funeral to pay their respects. They behaved like the lady and gentleman they are. It is a shame that they had to sit there and listen to political garbage from people who have been running Washington for years and accomplished very little. The Daily Wire posted an article today about the disinviting of Kaitlan Collins, a White House correspondent for CNN, to a Rose Garden press conference. The media would have you believe that Ms. Collins is being censored for asking the wrong questions or that CNN was barred from the Rose Garden press conference. Neither is true. But White House Press Secretary Sarah Sanders offered a very different account. When you are asked to leave the Oval Office, it is wise to do so. Just as fellow CNN White House correspondent Jim Acosta has been doing since Day 1 of the Trump administration, Collins is clearly trying to get famous by being “tough” on the president. But she’s not being tough, she’s being rude. Ask a question, maybe two, then get out. So now, that’s a new tactic by the press: Get into the Oval, then simply refuse to leave. When Trump tires of the tactic (he will) and bars the entire press corps from his office, the MSM will be up in arms. And when that happens, they should, perhaps, direct some of their ire toward Collins and Acosta. There’s a way to do the job, a very difficult job, without being rude. Give it a try, White House press corps, you just might like it. We need Emily Post to educate the press corps on basic manners. They seem to have forgotten or never learned them. 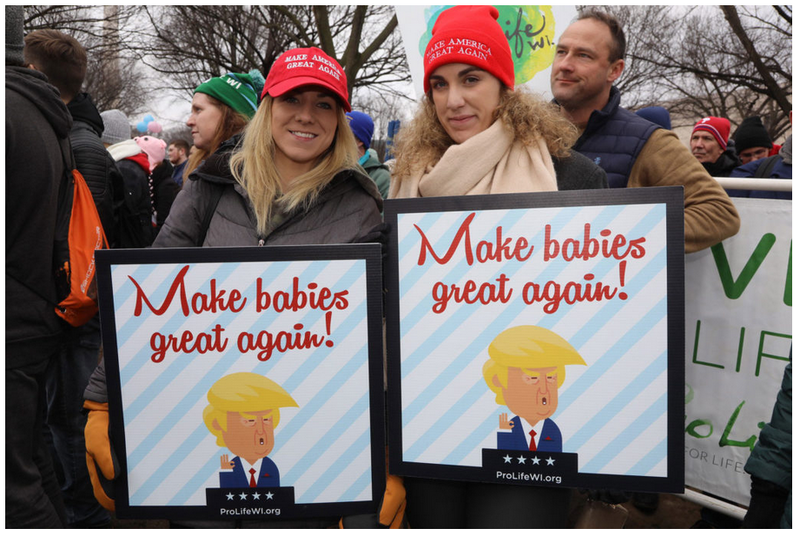 Yesterday First Lady Melania Trump launched her “Be Best” campaign to encourage healthy behaviors in children. 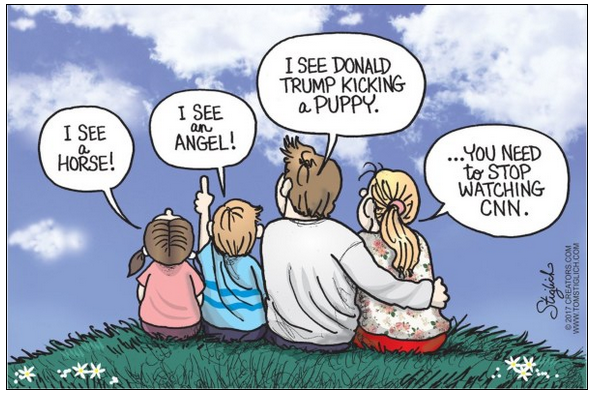 You would think there would not be a lot to complain about in that, but the mainstream media loves to complain about anything connected to President Trump, and complain they did. Many of the complaints had to do with the fact that Mrs. Trump speaks English with an accent. That shouldn’t be a surprise–it’s her fifth language! How many Americans speak five languages? How many Americans speak two languages? How many Americans speak proper English? Townhall posted an article today about one of the complaints. 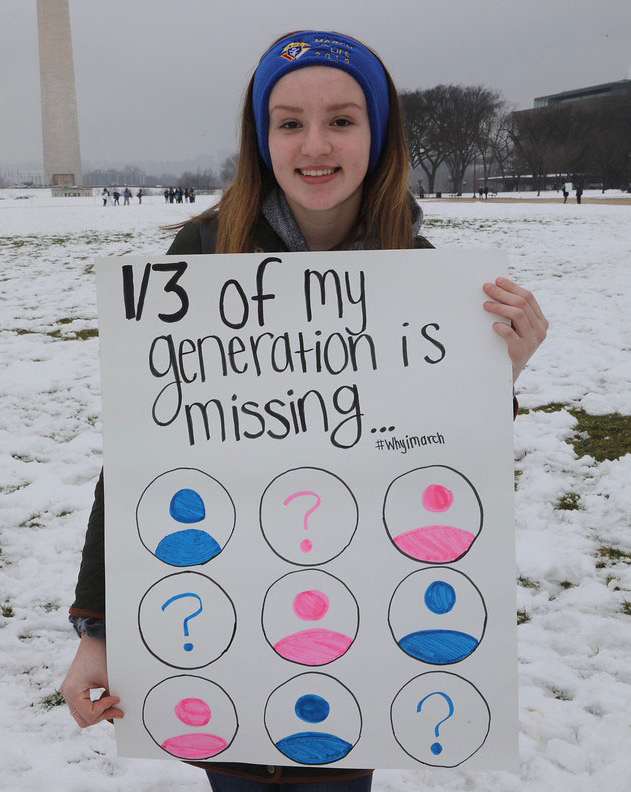 “There are a lot of realities that she is dealing with. This is a First Lady who is not culturally American but she is learning the ways,” Ryan said. How is that culturally not American? 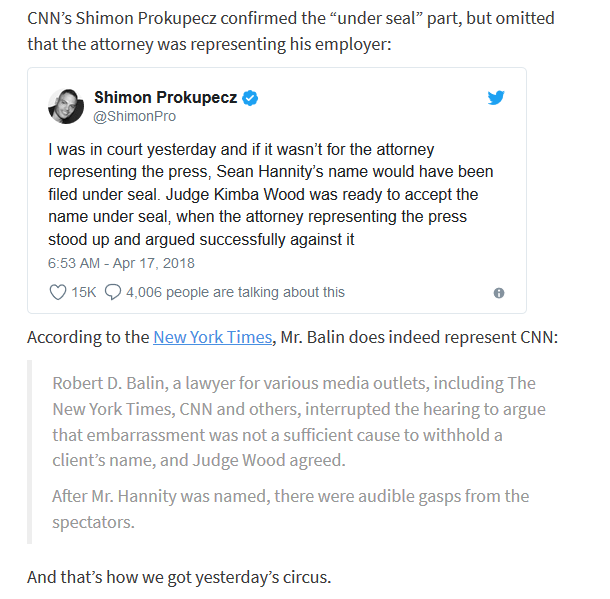 On Tuesday, Twitchy reported that during the Michael Cohen hearing (Judge Kimba Wood presiding–look her up), the lawyers that argued for the disclosure of a relationship between Michael Cohen and Sean Hannity were the attorneys for CNN and The New York Times. You don’t suppose they might have had a conflict of interest. Smile, you are being manipulated by hair-on-fire reporters and partisan judges. No person is entirely objective. No honest person claims to be. In the field of journalism, some of the people who claim to be objective are not, and some people simply admit their biases and go on from there. I have no problem with a reporter being biased as long as he is honest about where he is coming from. Tilted journalism occurs on both sides of the aisle. It is, however, interesting to see how far left of center most journalists have moved in the last thirty years. Up until the early 1990’s, there was one point of view being put forward–it began with The New York Times and continued through the three major television networks’ nightly news. When Rush Limbaugh began his national radio show, things began to change–conservative viewpoints were being heard. The monopoly was over. Fox News is actually slightly right of center, but is always being attacked as right wing. Actually CNN is so far left of center that it seems as if the center has moved. We will never have totally centered news–what we actually need is balance. A new network is attempting to bring that balance, and the cries of those in fear of losing their monopoly are getting loud. Yesterday The New York Post posted an article about Sinclair Broadcasting, a network which forced its news anchors to read a promotional statement on air about fake news. The gist of the statement was that Sinclair was not going to be fake news and was going to endeavor to be fair and objective. The reaction by other media was telling. Joe Scarborough, host of MSNBC’s “Morning Joe,” said that Sinclair appeared to running “Pravda-style propaganda” that he likened to the old Soviet Union. “So here you have an entire broadcasting system running a propaganda clip. “People will say, ‘Oh, look at the conservatives reading their scripts,’ [but] it’s actually got nothing to do with conservatives, it’s Trumpian and it does smack of … state-run media for an autocrat,” Scarborough said. The promo video did have one big booster: Trump tweeted his support. Does anyone remember President Obama’s JournoList? On July 25, 2010, The Daily Caller posted an article about the JournoList. In 2007, when Washington Post blogger Ezra Klein founded Journolist, an online gathering place for several hundred liberal journalists, academics and political activists, he imagined a discussion group that would connect young writers to top sources. But in the heat of a bitter presidential campaign in 2008, the list’s discussions veered into collusion and coordination at key political moments, documents revealed this week by The Daily Caller show. …Yet Journolist’s discussions show an influential left-wing faction of the media participating in a far more intentional sort of liberal bias. Journolist’s members included dozens of straight-news reporters from major news organizations, including Time, Newsweek, The Associated Press, Reuters, The Washington Post, The New York Times, Politico, Bloomberg, Huffington Post, PBS and a large NPR affiliate in California. Aren’t these some of the same people who are going crazy because Sinclair Broadcasting spoke out against fake news? Seems like the pot calling the kettle black. When Andrew McCabe was fired, there were a lot of questions as to why he was fired and why he was fired when he was fired. That information is slowly leaking out. The other information that is leaking out with that is that the alleged affair between Strzok and Page may have simply been a shiny object put in front of the public to take our attention away from what was actually happening. The Conservative Treehouse posted an article today about Andrew McCabe. It seems that the reason for Mr. McCabe’s firing was that he had made a number of false statements to the Inspector General, to internal federal investigators, and to James Comey. The interesting aspect of this information is that it comes from leaks at CNN. Giving credence to the reason why Inspector General Horowitz and Federal Prosecutor Huber don’t want to release unredacted investigative information to a leaky congress, a report surfaces via anonymous sources to CNN. The leaked information comes after the DOJ released the substance behind the FBI Office of Professional Responsibility (OPR) recommendation to fire former FBI Deputy Director Andrew McCabe. Previously, Inspector General Michael Horowitz referred McCabe’s false statements to the OPR; the OPR reviewed, investigated and then recommended McCabe’s termination to Attorney General Jeff Sessions. Sessions fired him. Congress was recently provided information from within the IG referral and OPR report. Those details are now leaked, with an accompanying narrative, to CNN. I’m skipping most of the narrative outline because, well, it’s an editorial narrative. However, at the bottom of the CNN narrative there’s an important series of dates which highlight the larger issue with McCabe. The truth on what was actually going on at the FBI is coming out slowly, but it is coming out. If the report of serial lying by McCabe is accurate then he has bigger problems than his sacking by Jeff Sessions. Criminal charges may well be in his future. McCabe has already raised $500,000 via a fundraising page for his legal defense. Smart move. I don’t like to see anyone’s life ruined by stupid mistakes, but it seems as if some of the higher ups in the FBI were out to destroy other people’s lives. I guess poetic justice (and karma) have a way of catching up with all of us. Just as an aside, President Trump’s first place fake news award went to the New York Times’ Paul Krugman who claimed on the day of President Trump’s historic, landslide victory that the economy would never recover. Considering the past year, that was a wonderful choice for the fake news award. This year, 2018, is the year that the Tax Reform Bill passed by Congress will begin to take effect. We are already seeing the beginnings of that effect as companies are giving raises, bonuses, and bringing money into America from overseas. Working people are beginning to feel the impact of what Congress did (and what NO DEMOCRAT voted for). Corporations have decided to share their tax break with their workers. So what happens when people begin to realize that almost everything the media told them about the tax bill was a lie? Breitbart posted an article today that partially answers that question. This is a huge (and predicable) turnaround when compared to those polls released in the heart of the media campaign to kill the tax bill. In early December, Gallup showed just 29 percent support for the bill; as did Quinnipiac. Less than a month ago, the left-wing cable news network CNN released a poll that showed support for the bill cratering with opposition climbing from 45 percent to 55 percent. Only one-third of Americans were in favor of the tax cut. Considering the media’s 24/7 opposition to the bill, these negative polls were not all that surprising. In a cynical and partisan effort to kill the GOP tax cut through the use of lies to gin up opposition, including the wildly false claim that only the rich and corporations would benefit, some outlets even went so far as to claim that taxes on working people and the middle class would increase. And polls showed that too many people actually believed that nonsense. When did allowing people to keep more of the money they earn become controversial? How long can the media continue to misreport news and still be listened to? 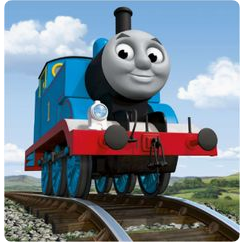 The American Thinker posted an article today about CNN’s claim that Thomas the Train and Paw Patrol are ‘fascist cartoons.’ I will admit that I know nothing about Paw Patrol, but I spent many happy hours with my grandchildren watching Thomas the Train. So what is the basis of the objections? It seems as if the political left has declared war on the basic values that form the foundation of western civilization. I guess the concept of repentance and improved behavior is a concept they have somehow overlooked. 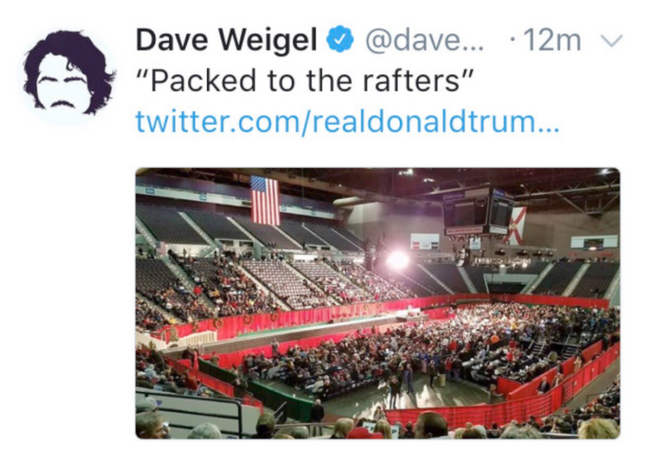 What Mr. Weigel failed to mention was that the picture was taken before the Trump rally began. 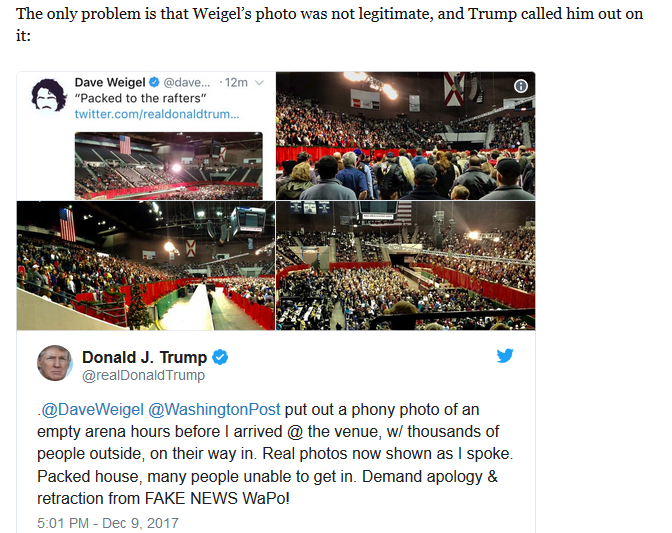 I doubt the mainstream media made the correction (although Mr. Weigel’s tweet was deleted). This is the reason the President tweets–to get the truth out when the mainstream media lies. Investor’s Business Daily posted an article today about three of the latest mainstream media’s attempts to accuse President Trump and Russia of conspiring together in the 2016 election. Unfortunately, the facts keep getting in the way of the accusations. It turns out none of this had anything to do with electing Trump. The YouTube page contained news reports, amateur footage and the like that the Black Lives Matter crowd were parading all over the web. If that constitutes “meddling” in the election, then Black Lives Matter, Hillary Clinton and the mainstream press are guiltier than these Kremlin trolls. They ceaselessly pushed the racist police story because they thought it would help energize the Democratic base. So what was Russia’s intent? “It’s unclear,” is all CNN could muster. Had CNN finally found evidence that Russia tried, and might have succeeded, in swinging the election for Trump? 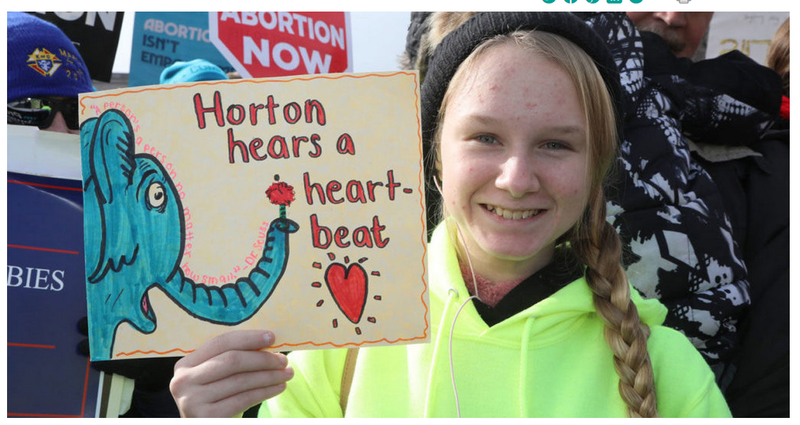 It was up to the Washington Examiner’s Byron York to provide the relevant facts and context. He found that of the 3,000 Russian ads that Facebook turned over to Congress, most of them ran after the election and so could hardly be part of any “meddling.” The vast majority didn’t mention the election or any candidate. A quarter of them weren’t seen by anybody. What’s more, out of those 3,000 ads, only a tiny handful targeted Michigan and Wisconsin, nearly all of them ran in 2015 — well before Trump was nominated — and most had fewer than 1,000 impressions. …the infamous “smoking gun” meeting between Donald Trump Jr and a Russian lawyer is turning out to be another nothingburger. Newly released emails showed that the meeting was entirely focused on U.S. sanctions and adoption rules involving Russia, and had nothing to do with dishing dirt on Hillary Clinton. What about that promise of a meeting in a separate email from British publicist Rob Goldstone, who said the Russian lawyer had damaging evidence on Clinton? It’s likely that was a way to lure Trump people to a meeting they’d otherwise not bother with. For nearly a year now, we’ve seen this same pattern. A headline-grabbing story about Russia “meddling” and Trump “collusion” that ends up fizzling out when the facts come in. If Russia’s motivation in all of this wasn’t to elect Trump, but to sow discord and hostility within the U.S. — which increasingly looks like the point — then Russia’s leaders succeeded beyond their wildest imagination. And for that, they have the liberal media, not their own efforts, to thank. Imagine what the media could do if they investigated the uranium transfer to Russia that followed a large Kremlin donation to the Clinton Foundation?